The LEGO® DUPLO® 10874 Steam Train is now even easier for your toddler to control and interact with in multiple ways. Young children can become the train driver with the Push <(>&<)> Go motor — a gentle push either forwards or backwards sends the train on its way and a firm hold or lift off the tracks will make it stop. Help them place the 5 colored action bricks along the track to sound the horn, turn the lights on and off, pause and refuel, change direction and stop the train wherever they like. With a train station, coal tipper, 2 DUPLO figures plus an animal figure and a simple toy train track included in this LEGO DUPLO set, preschoolers can enjoy classic, fun train play. Download the optional app to unlock even more play possibilities, including remote-control function and fun activities to complete with your toddler! Price is 31% below the initial Lego retail price, a € 19.48 discount! This comes down to 72.80 cent per brick. The Steam Train (10874) Lego set is available from the sites below. However, they do not offer delivery to your selected region. The Steam Train (10874) Lego set is no longer directly available from the sites below. However, 3rd party partners of these sites might still have the set available. 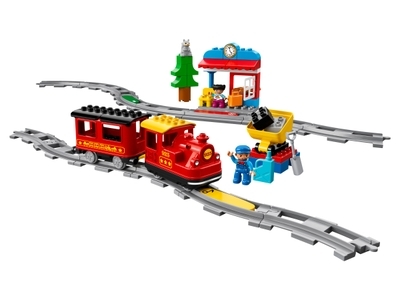 Alternate description The LEGO® DUPLO® Steam Train is as easy as Push & Go! Features a buildable Push & Go locomotive with lights and sounds, passenger carriage, 5 color-coded action bricks, train station, coal tipper, tree and 16 pieces of track. Show your child how to place and move the 5 colored action bricks around the track so the train follows their instructions to sound the horn, turn on the lights, refuel, change direction or stop. Combine with the 10872 Train Bridge and Tracks, 10875 Cargo Train and 10882 Train Tracks for even more track combinations and LEGO® DUPLO® train fun. Steam train with passenger car measures over 3” (10cm) high, 11” (30cm) long and 2” (7cm) wide.